Sly Park offers a unique and serene gathering point for private groups of 20 to 220 people. Sly Park's location in the beautiful Eldorado National Forest provides an experience our visitors never forget. Sly Park Conference Center is a premiere camp facility offering food service, overnight accommodations and a menu of program activities for groups of 20-220. 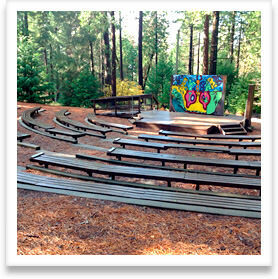 Our facility is available for private group rental during our non-environmental education program days. Please call us at (916) 228-2485 to speak with the Sly Park Reservation Specialist to check on date availability and rental rates. Rates are based on number of participants, menu requests, and parts of campus being used. Photo Tour: Slide show of all buildings and rooms, grouped by Campus / Lodging / Cafeteria / Meeting & Class Rooms / Administration. Reservation Information: Information about group sizes, making reservations, and planning your retreat. Location: Maps and directions to our location and of our site. Weather: General trends of weather during the various times of year.